In August 2018, the individual income tax laws in the People’s Republic of China saw their biggest changes in decades, particularly with regard to the tax residency classifications for foreign nationals. Individuals classified as tax residents in the PRC can be subject to taxation on their global income in addition to their income earned in the country. The announcement of the change from a 365 day period to 183 days for determining residency was particularly significant to overseas companies and expatriates, with a great degree of uncertainty over how the new policies would be implemented and how individuals working in the PRC could best prepare themselves in advance, in terms of their residency arrangements and tax strategy. Although there has been a lot of talk and speculation about expatriates and non PRC citizens losing their advantages and potentially facing difficulties in China, the newest announcements from the authorities indicate that the implementation guidelines for the new laws will benefit middle class PRC taxpayers without any serious disadvantages to individuals that would prefer not to be classified as tax residents, although their income and residency will be assessed according to new standards that still call for proactive adjustments to ensure a smooth transition. On October 20th, 2018, the National People’s Congress released further details about the amendments and their implementation, which has closed for public consultation on November 4th and will take effect from January 2019. Under the new draft guidelines, expatriates residing in China for a period exceeding five consecutive years without a 30 day absence from the country will incur tax liability for all income generated both within the PRC and abroad, regardless of whether it is paid by Mainland China or overseas entities. However, expatriates who spend between 183 days and 5 years will be exempted from paying taxes on income earned outside the PRC from overseas entities, while still paying taxes on domestically generated income and overseas income from Mainland China entities. Individuals who spend more than 90 days but less than 183 days in the country pay taxes on all income generated within the PRC but will be exempted from all overseas income. Expatriates who spend less than 90 days in mainland China will only be responsible for income earned from PRC entities in the country, and will not have to pay taxes on income earned from overseas entities domestically or on any overseas income. Therefore, it is likely that depending on your individual circumstances you may not have to take on any additional tax burden unless you are present in Mainland China for a period exceeding 5 years without a 30 day absence, just as before. It may also be possible for you to change your residential arrangements, particularly the amount of time you spend in mainland China, or consider the location and provenance of your income. Household registration, supporting a family (children or elderly parents) or extensive economic interests (as yet undefined) are all factors that classify non PRC citizens as tax residents, but according to the newly released implementation guidelines, a 30 day trip (consecutive 30 day absence from PRC) every 5 years would suffice to maintain non resident classification for tax purposes. Under the tax category of “comprehensive income”, individuals that receive a salary as well as payments from royalties, copyright or license holder’s remuneration may face a higher tax burden than under previous Individual Income Tax Laws due to the annual levy on this category according to the 7 income brackets, while non tax residents can continue to file these earnings on a transactional basis. Within the 7 tax brackets covering comprehensive. Income, the highest is set at 45% for individuals earning over 80,000 RMB per month. Income between 55,000 and 80,000 RMB is subject to 35% tax, while taxes for the 35,000 to 55,000 RMB bracket will be levied at 30%. Earnings between 25,000 and 35,000 RMB will be taxed at 25%, 12,000 – 25,000 RMB at 20%, 3,000 – 12,000 RMB at 10% and the lowest bracket, below 3,000 RMB at 3%. Individual income tax fillings from leasing, contracting, commercial and production income will be subject to five taxation brackets, ranging from 5% to 35%, under the consolidated “business income” category. For anyone considering the benefits and drawbacks of tax residency status, there are now additional details about tax relief. The National People’s Congress has released further details on eligible deductions and allowances for resident taxpayers, which includes expatriates classified under the tax resident category. Expenses related to children’s education can be deducted at 12,000 RMB per year or 1,000 RMB per month, while adult education can be deducted at between 3,600 to 4,800 RMB per year. Rental deductions, depending on the area, will be set at between 800 to 1,200 RMB, while housing loan interest for first time homeowners can be deducted up to 1,000 RMB per month. Medical costs for treating severe illnesses are potentially eligible for up to 60,000 RMB per year in deductions. The threshold of personal income tax deductibles is raised from 3,500 RMB to 5,000 RMB per month, with the overall effect of reducing the tax burden for the majority of the resident population. Although the exact details regarding specific exemptions are as yet forthcoming, it is expected that non residents will not be eligible for any specialized exemptions that are not also available to residents. PRC citizens seeking to terminate their residency and move overseas will be required to settle all outstanding Individual Income Tax obligations. An important development to note is the enhanced interconnectivity between mainland China authorities and overseas jurisdictions under the international Common Reporting Standard as of September 2018. 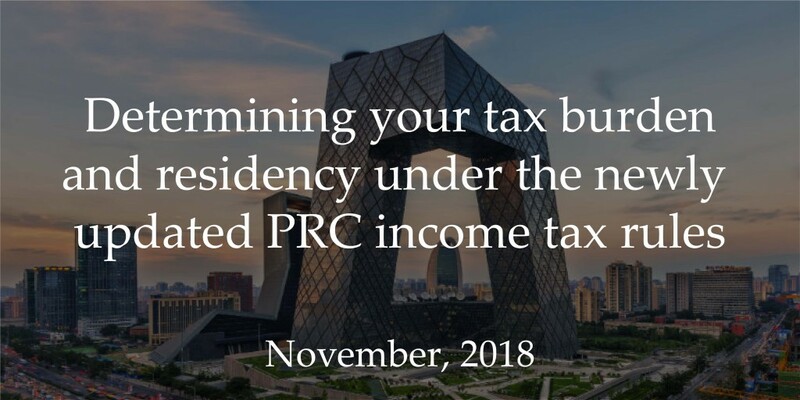 Furthermore, elements of the PRC’s enterprise taxation laws are being incorporated into the Individual Income Taxation system, such as tax identification numbers, the tax residency concept and the annual filing period. At Fung Yu, we are committed to keeping our clients ahead of the curve in the shifting landscape of PRC developments. Contact us for a free initial consultation and we can identify the ideal individual or enterprise tax strategy and residency arrangements for your needs, taking into account all circumstances, details and individual factors. With our experience and expertise we can guarantee that you will overcome all challenges without facing any excessive burdens or uncertainty.